Over 922,000 people were forced to flee their homes inside the Democratic Republic of the Congo (DRC) in 2016. This was the highest number of internal displacement due to conflict recorded globally, and was one of the most startling findings of the Internal Displacement Monitoring Centre’s global report which was launched in New York today. Read caption Gadi Alfine, 13, has lived in Mpati IDP settlement for three years alongside her three siblings and her mother. Her father passed away many years ago. Photo: Christian Jepsen/NRC. March 2017. The new IDMC report found that political insecurity in DRC aggravated long-standing ethnic tensions and clashes between armed groups last year, particularly in North and South Kivu provinces in the east of the country. Of the 3.7 million displaced people overall, over 1 million are newly displaced since the start of 2017 after violence clashes in Kasai province. Over half the rest of the people displaced are in North Kivu (837,000) and South Kivu (387,000). Twenty years of armed conflict and inter-communal violence has pushed millions of people into vulnerability, faced to fight off food insecurity, malnutrition and epidemic outbreaks. Communities in North Kivu province, for example, have been left with acute needs. Raids and communal clashes between armed groups in Walikale and Lubero territories forced nearly 373,000 people to flee their homes, making up 42 per cent of the province’s displaced population at the end of 2016. 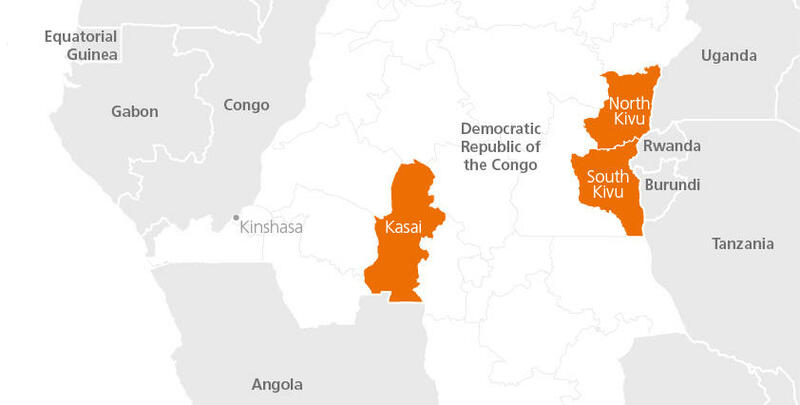 NRC is concerned by the UN mission in DRC, MONUSCO, reducing its presence in some territories. As such, it is crucial now more than ever that humanitarian agencies are able to step up efforts to ensure that displaced families are fully protected. “Unless we properly define who and how we can protect civilians after the UN mission scales down, DRC’s people will be plunged deeper into crisis,” warned Blom. 2.2 million people are internally displaced, and over 550,000 people have fled the country as refugees. 7.3 million of DRC’s 92 million people are estimated to need humanitarian aid. DRC is among the last 10 per cent of the least developed countries in the world, according to United Nations Development Programme. NRC has spokespeople in DR Congo available for interview. Read the full IDMC Global Report on Internal Displacement. Photos are available for free use: http://smu.gs/2ruzalD. B-roll video is available here: http://bit.ly/2pX9L3O. The Norwegian Refugee Council is a humanitarian organization working in more than 25 countries globally. It set up in DRC in 2001, and today helps communities in Baraka, Beni, Bukavu, Goma, Kinshasa, Kirumba, Kitchanga, Masisi, Nobili and Pinga. IDMC was established by NRC in 1998. Monitoring internal displacement caused by conflict, violence, human rights violations and natural disasters worldwide, IDMC is widely respected as the leading source of information and analysis on internal displacement throughout the world.